Kennedy Lake wedged between Big Sam and Leavitt Peak in the Emigrant Wilderness. Summit Creek below Relief Reservoir and above Kennedy Meadows along the Tahoe to Yosemite Trail. This view above of Kennedy Lake and its surrounding to our Northwest opens up as we climb South higher up Big Sam. The trail coming East up Kennedy Lake's valley starts from the Tahoe to Yosemite Trail along Summit Creek, a bit South of, and above the Kennedy Meadows Pack Station Trailhead along Highway 108. That trail junction location is in the scope of the picture above, but out of view at the far end of the S-turn at the bottom of Kennedy Lake's valley. TYT to the PCT via Kennedy Lake. Directly below our vantage point in the image above we can see the terrain from the upper shore of Kennedy Lake up towards us and the PCT. Down there is where a good-quality unmaintained trail route finishes linking these two classic trails. 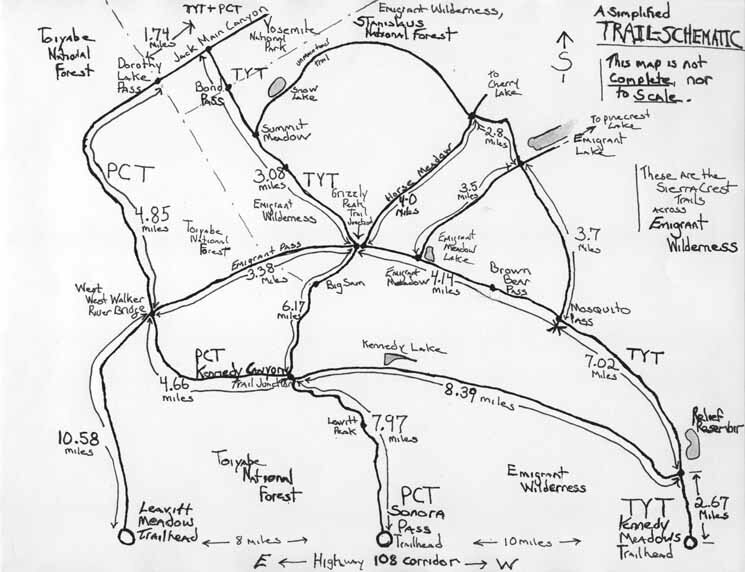 The page below traces the Kennedy Lake Trail West from its Western Start along the TYT to its Eastern end at the Kennedy Canyon trail junction along the PCT. 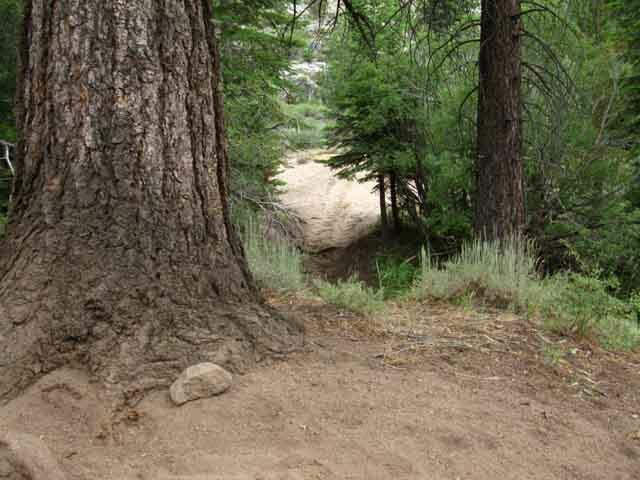 The trail to Kennedy Lake does not directly assist hikers on the Tahoe to Yosemite Trail. Knowledge of this route option could be put to good use by Northbound hikers on the Pacific Crest Trail, and any backpackers looking for fine loop and Trailhead to Trailhead backpacking in Emigrant Wilderness. 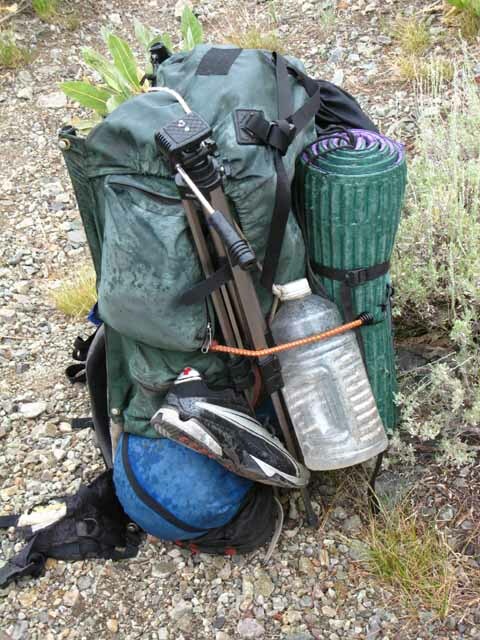 At the Kennedy Canyon trail junction PCT hikers are 7.97 miles South of Sonora Pass. These 7.97 miles consist of climbing over Leavitt Peak followed by hitch-hiking 9 miles West on Highway 108 to the 1 mile road South out to the Kennedy Meadows Pack Station to pick up their Resupply package. PCT hikers have another option. 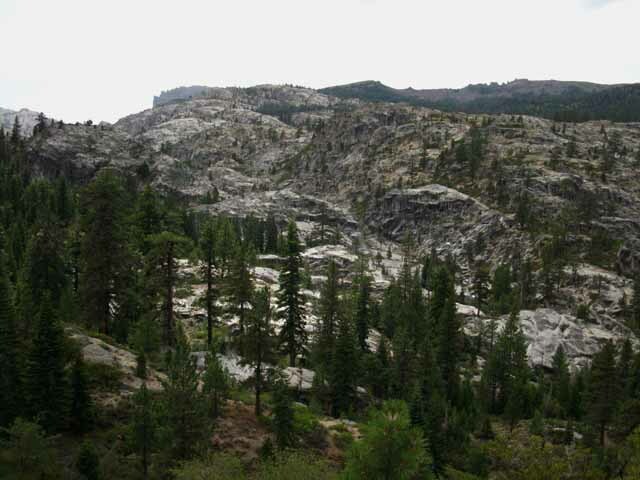 From the trail junction at the top of Kennedy Canyon it is 11.06 miles West down to Kennedy Meadows Pack Station via Kennedy Lake and a short hike North along the Tahoe to Yosemite Trail down to Kennedy Meadows Pack Station. This route is virtually all downhill. The page below describes the trail linking the PCT and TYT via Kennedy Lake. The Kennedy Canyon trail junction along the PCT at the East end of the Kennedy Lake Trail is the Northern of two four-way trail junctions South of Sonora Pass along the Sierra Crest in the Emigrant Wilderness. The next four-way junction to our South is located at Grizzly Peak. 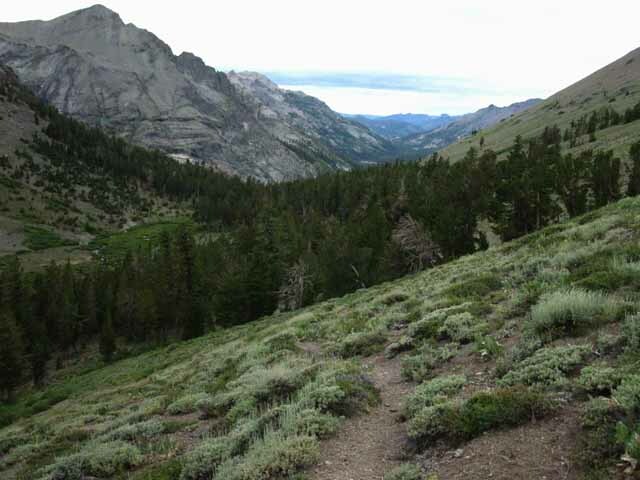 The Kennedy Canyon trail junction could be very helpful in planning long distance loops or trailhead to trailhead backpacking trips around the Emigrant Wilderness. 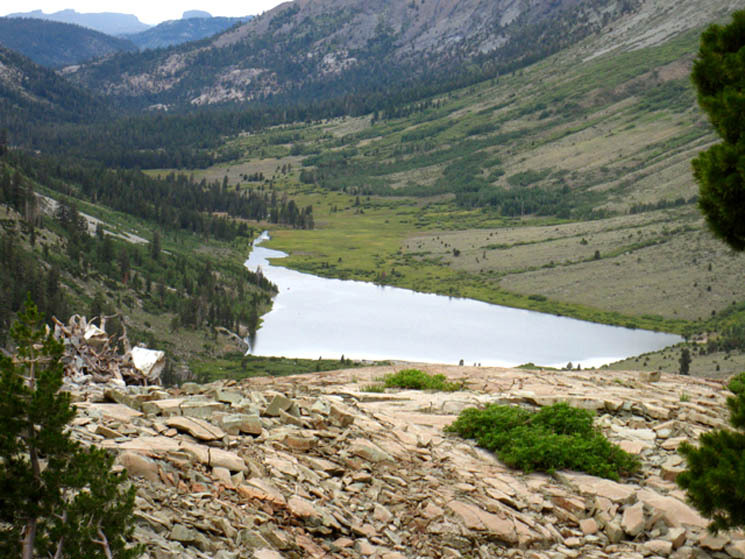 Tahoe to Whitney Backpacking Trips. Kennedy Lake trail running East-West from the TYT above Kennedy Meadows Pack Station to the Kennedy Canyon trail junction on the PCT. The Kennedy Lake trail junction along the Tahoe to Yosemite Trail is located 2.67 miles South of and and 720 feet above Kennedy Meadows Pack Station. 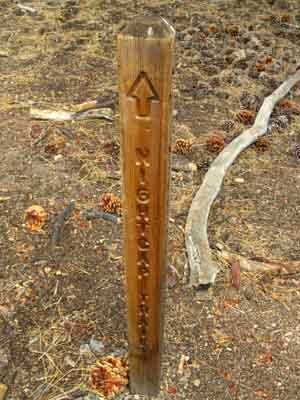 The Kennedy Canyon trail junction along the Pacific Crest Trail is located 7.97 miles South of Sonora Pass. Leavitt Peak sits between Kennedy Canyon and Sonora Pass. The trail East up to and past Kennedy Lake from the trail junction along the Tahoe to Yosemite Trail linking to the PCT trail junction at the top of Kennedy Canyon is an 8.39 mile trail segment linking up the TYT on its Western side with the PCT on its Eastern end. 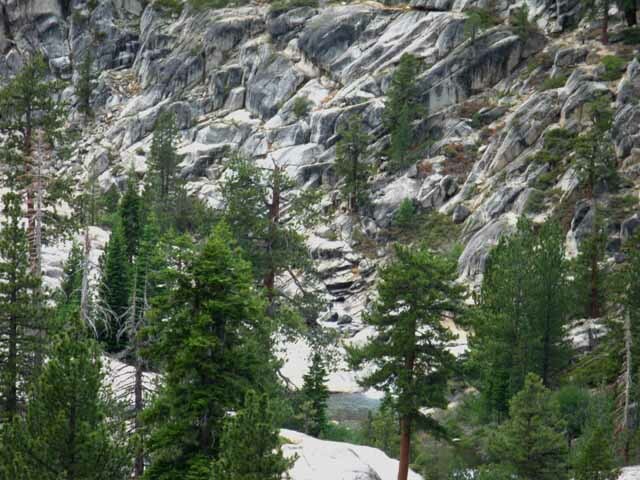 The Kennedy Lake trail junction is 2.67 miles hiking South up Summit Creek along the Tahoe to Yosemite Trail from the Gate on the South side of Kennedy Meadows Pack Station. 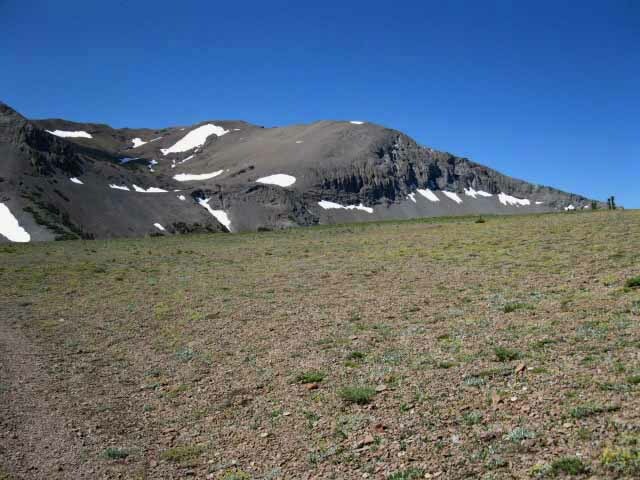 The Kennedy Canyon trail junction is located at the base of the South Flank of Leavitt Peak after hiking 7.97 miles South over the Leavitt Massif along the Pacific Crest Trail from the Sonora Pass Trailhead on Highway 108. 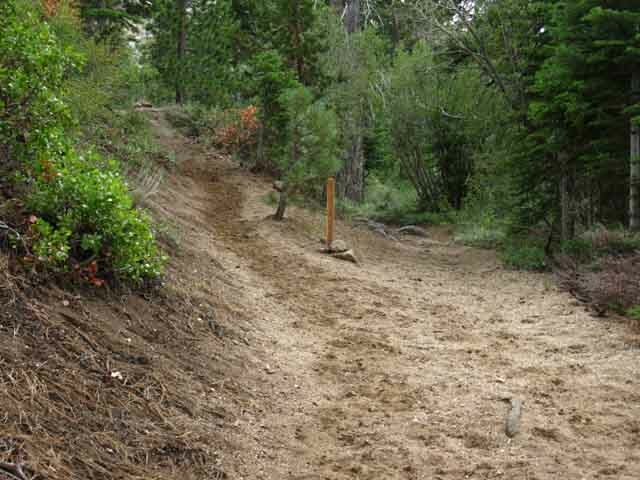 The trail above Kennedy Lake East up to where it terminates at its junction with the PCT at the Kennedy Canyon trail junction is unmaintained. I found mostly good trailbed and an easy to follow route through here during July of 2012, but conditions will change year to year. It has some faint sections. Kennedy Lake itself sits East of the midpoint between the TYT and the PCT. Though Kennedy Lake is a good stand-alone destination for Emigrant Wilderness backpackers, it is even better as a part of a longer backpacking loop around the Emigrant Wilderness. 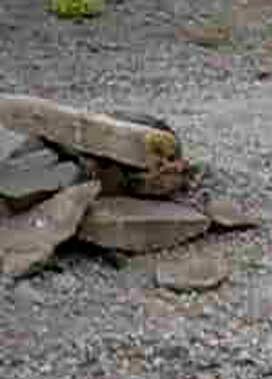 Let's look at our hiking options on both the East and West sides of Kennedy Lake. The Kennedy Lake Trail begins through a Y junction Eastbound off the North-South line of the Tahoe to Yosemite Trail South of Kennedy Meadows Pack Station. Southbound hikers veer Left, to our East, hiking towards Kennedy Lake and the Sierra Crestline above & beyond. 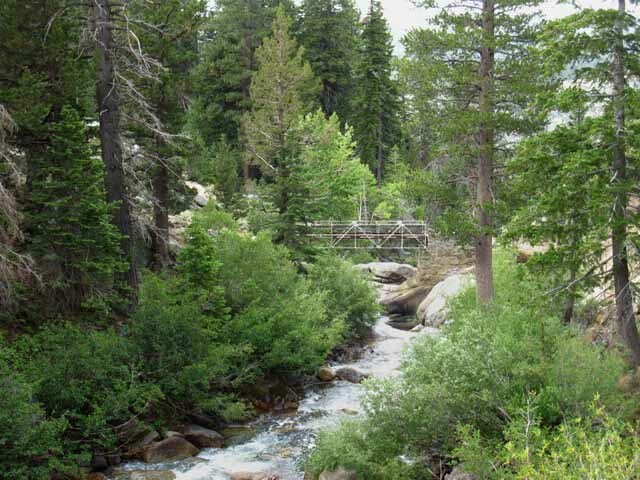 This page below describes the 8.39 miles hiking from the TYT at the Kennedy Lake trail junction to the PCT at the Kennedy Canyon trail junction along the Sierra Crest. 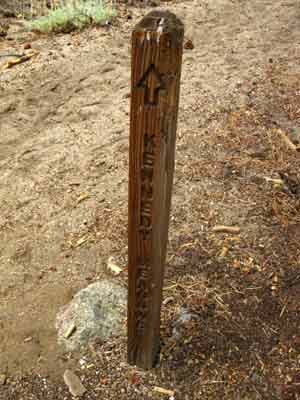 The Kennedy Canyon Trail Junction along the Pacific Crest Trail. The page following below tracks West to East from the TYT above Kennedy Meadows to the PCT at the Kennedy Canyon trail junction. 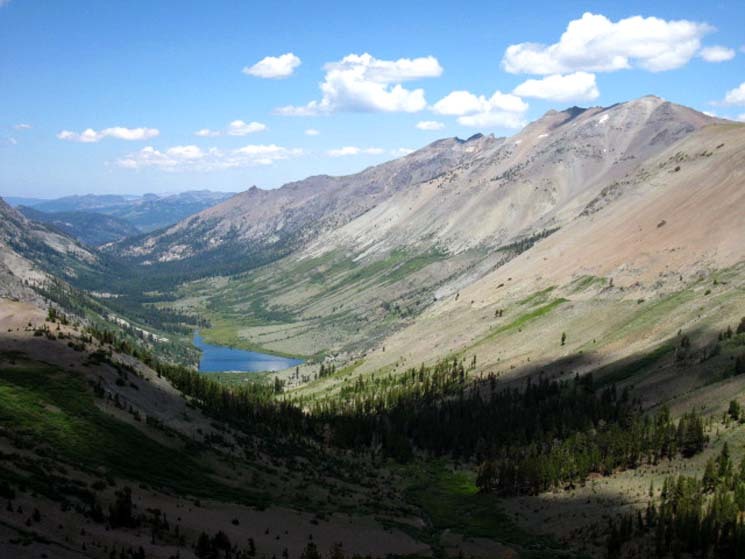 Local Emigrant Wilderness backpackers can ascend the 19.03 miles between the Kennedy Meadows and Sonora Pass Trailheads via Kennedy Lake. That's a nice little trip. It's also true that for every trip we can plan hiking South down the Sierra Crest from Sonora Pass and turning West to get off (or onto) the Sierra Crest by swinging back to Highway 108 along the Western Flank also has a mirror-image trip turning down the East Flank off (or onto) the Sierra Crest. 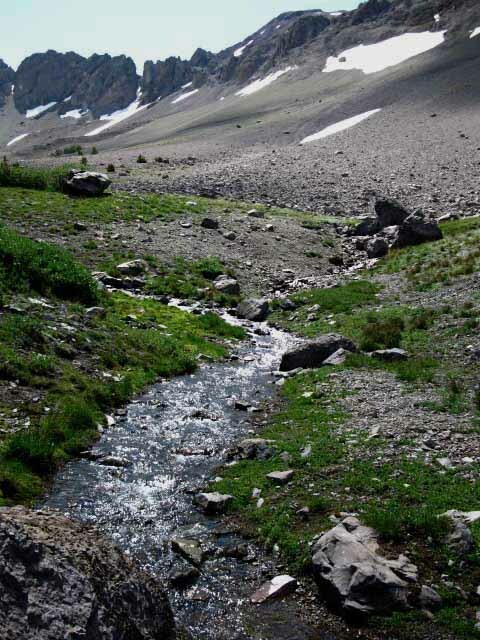 The Eastern flank version of the hike from Sonora Pass to Kennedy Meadows is the backpacking trip we can craft from Sonora Pass to Leavitt Meadow. We would turn East down Kennedy Canyon rather than West down Kennedy Lake from the Kennedy Canyon trail junction. 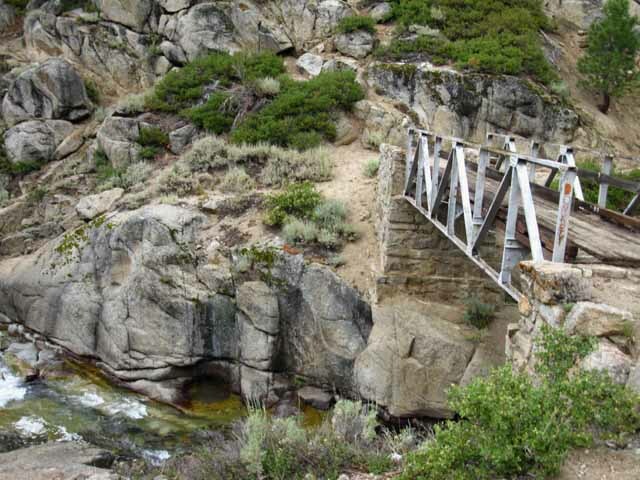 The next rung on this Southbound hiking ladder is adding about six Southbound miles from the Kennedy Canyon trail junction over Big Sam to the Tahoe to Yosemite Trail junction at the base of Grizzly Peak. This pushes up the miles of a West flank backpacking trip from Sonora Pass to Kennedy Meadows via Grizzly Peak to around 26 miles. 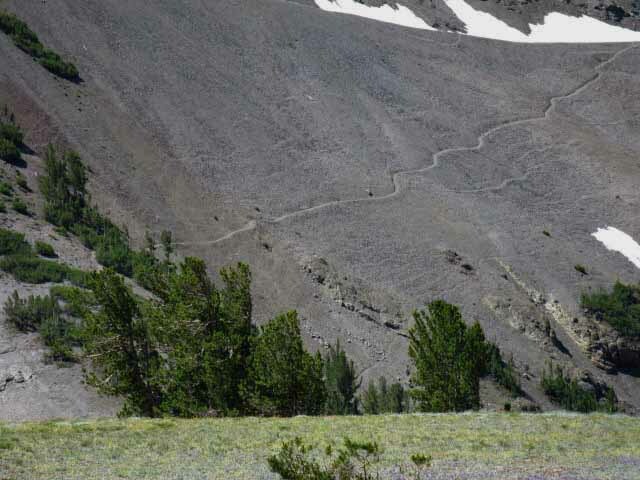 The Eastern version would follow exactly the same route South from Sonora Pass to Grizzly Peak, then hike East through Emigrant Pass down to the West West Walker on the way to Leavitt Meadow Trailhead on the East Flank rather than hiking West through Brown Bear Pass to follow the TYT North down to Kennedy Meadows along the West flank. That covers two levels we can swing this trip out to. The third and furthest level hiking South from Highway 108 with the intent to return would be hiking through Bond and Dorothy Lake Passes as our turnaround maneuver. We are changing direction, turning ourselves back into Emigrant Wilderness by hiking through both passes. I've hiked through both passes on one trip a couple of times doing huge loops all around the upper portions of the Emigrant Wilderness. Just hiking through one pass means we're continuing South to Tuolumne Meadows, which is also a heck of a lot of fun. It takes both passes to turn around. 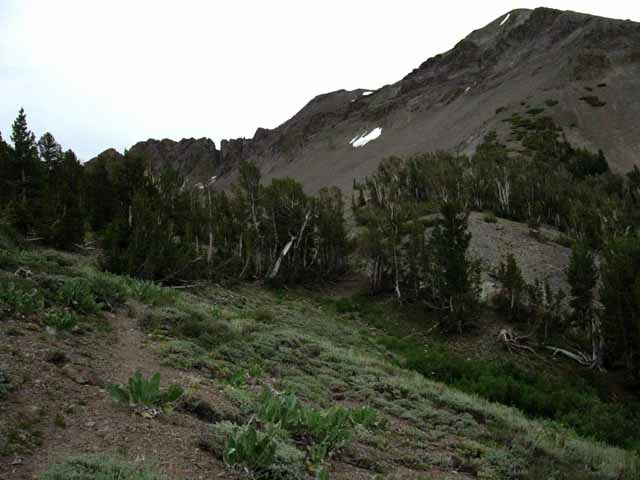 Once you have checked out a few of these increasing-distance hiking options you can think about stitching the Eastern and Western routes together into grand loops incorporating both the TYT and PCT routes around the upper high elevation reaches of the Emigrant Wilderness. The Tahoe to Yosemite and Pacific Crest Trail routes act like different sides of a triangle laid North and South across the opposite sides of the Emigrant Wilderness. The trail through Kennedy Lake depicted on the page below is the first trail that connects these two trails on their respective routes just South of Highway 108. A bit further to the South the trail over Big Sam also connects the TYT and PCT routes, as does the Emigrant Pass trail junction near Grizzly Meadow and Grizzly Peak. 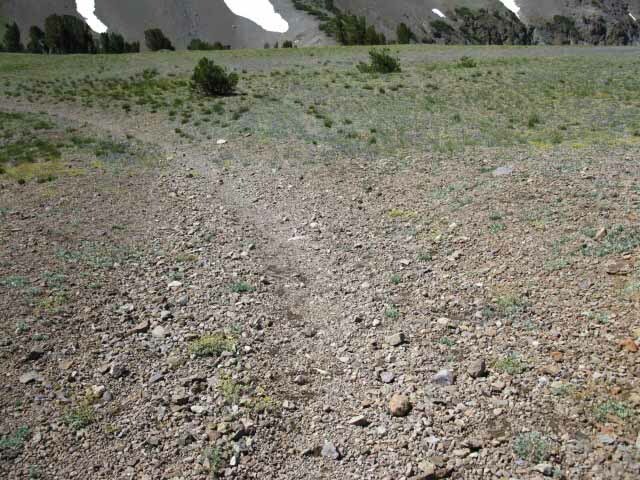 The furthest and final intersection between the TYT and the PCT South of Sonora Pass sits just East of the Emigrant Wilderness boundary at the Eastern bases of Bond and Dorothy Lake Passes. My point is that all of these connector trails allow backpackers to construct loops hiking either the PCT or TYT South into Emigrant Wilderness from Highway 108 to pivot and change directions by hiking onto the other trail to begin looping back to your starting trailhead, or to of the other trailheads accessible from Highway 108. Once you reach Highway 108 it is fairly easy to hitch a ride any of the other trailheads along Highway 108, if you left you car there. Viewed as part of a longer loop the trail through Kennedy Lake allows us to hike a nice semi-circle route from Kennedy Meadows to Sonora Pass via Kennedy Lake. More aggressive hikers will push further South, and not turn North towards Sonora Pass until reaching Grizzly Peak while the strongest hikers, or those with the most time, will hike all the way South to Bond Pass before changing directions and trails to hike back to Highway 108. There are endless options for exploring the Emigrant Wilderness on short in-and-out backpacking trips or via grand loops swinging back to your starting trailhead or by plotting sweeping arcs from one Highway 108 trailhead to another. This trail connecting the TYT and PCT via Kennedy Lake is the first PCT-TYT connector trail South of Sonora Pass. 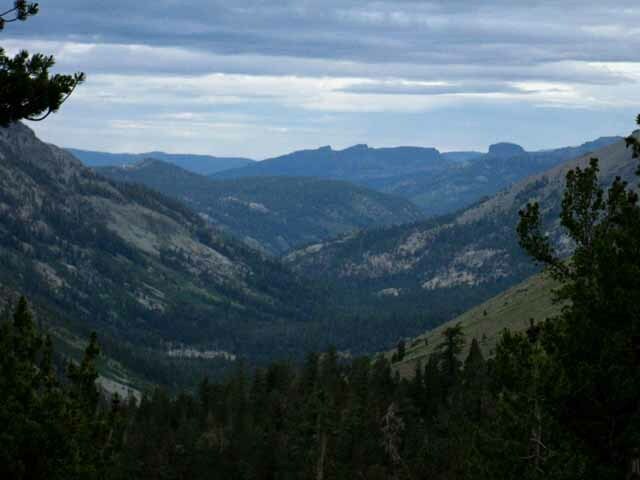 The next connector trail brings us South from Kennedy Canyon down to the trail junction at Grizzly Peak, and our Southernmost link between the PCT & TYT is their final junction in Jack Main Canyon. Video of 8.39 miles hiking West from the Kennedy Canyon trail junction on the Pacific Crest Trail to the Kennedy Lake trail junction on the Tahoe to Yosemite Trail North of Relief Reservoir. Hiking South up to the Kennedy Lake trail junction along the Tahoe to Yosemite Trail. This is the start point of this 8.39 mile length of trail connecting the TYT to the PCT at the Kennedy Canyon trail junction. Right continues South to Relief Reservoir along the Tahoe to Yosemite Trail. Left turns East to Kennedy Lake and the termination of this trail at the Kennedy Canyon trail junction along the Pacific Crest Trail. Less than a hundred yards East of Kennedy Lake trail junction we see big trail to what looks like a big campsite. Climbing up into Kennedy Creek's canyon we climb through a saddle in the Eastern ridge above us. We begin to get views to the Southwest from a high point on the West side of the saddle looking at the top of the Turtle Rock feature on the Southwest side of Relief Reservoir peeking up over the granite in the middle distance. Relief Reservoir sits between the two. Here we can begin to see the fingers of gray to pinkish granite terrain slashing into the ocean of volcanic terrain defining the complex interface between the two that gives Emigrant Wilderness such a spectacular character. Coming through the saddle we are high above Kennedy Creek where it turns Northwest through a deep canyon above its confluence with Summit Creek. As we hike East we come down to Kennedy Creek as it flows down a fairly gentle descent below Kennedy Lake. Before we rejoin Kennedy Creek we see that these sheer granite canyons shelter many delights. Fine blue and green pools like the one above can be spied out at the bottom of the deep and steep gorge Kennedy Creek flows through at its Western end. If you are looking for some real adventurous fishing where the best part is getting to the fish, you've found a little piece of heaven here in the Emigrant Wilderness. 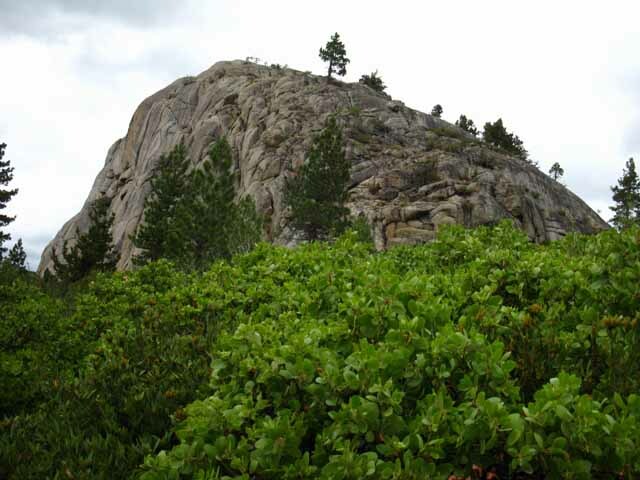 A Top Rock in the saddle between Kennedy and Summit Creek valleys. Remember, we observed where Kennedy Creek falls into Summit Creek just below the upper footbridge. Now we are cutting over to the Kennedy Creek canyon from higher up Summit Creek's canyon. Below we can see where Kennedy Creek falls into Summit Creek far below, where the low arm of white granite appears to block the valley. That's where the wishbone split of the canyons brings these two creeks, Summit and Kennedy Creeks together. From the position above we are hiking West towards the canyon holding Summit Creek with a view Northwest down the narrow valley carrying Kennedy Creek down to Summit Creek through the larger valley beyond down to Kennedy Meadows Pack Station and Resort. View looking West across bridge. 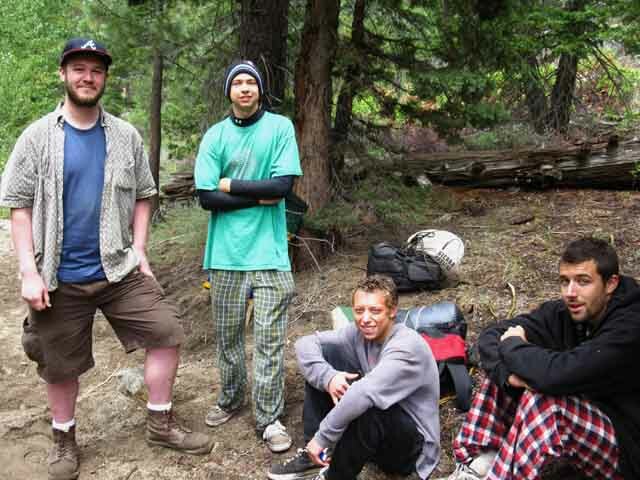 The hikers are Charlie, Max, Ian and Joey who you will meet just a bit lower down this page towards Kennedy Lake. Once we reach the Kennedy Creek Bridge the steep climb West up from Summit Creek is over. 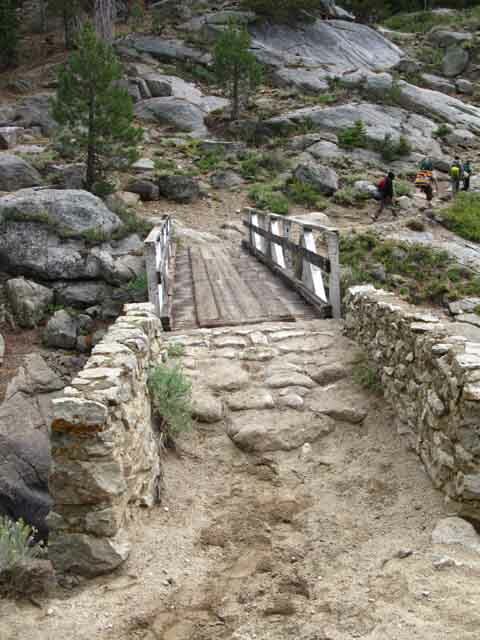 A moderate 4.76 mile climb separates the Kennedy Creek Bridge from campsite on the Northeast side of Kennedy Lake. East of Kennedy Lake the trail again steepens for the 3.05 mile hike up to the Kennedy Canyon trail junction with the Pacific Crest Trail which is situated on a low point along the Sierra crestline. The terrain here screams "Western," imparting the feeling of being transported back to the days of gold and silver. View of the footbridge from the East, upstream. Charlie, Max, Ian and Joey below Kennedy Lake. Hiking West I encountered these dudes taking a break along the trail. After an awkward moment during the first seconds of our encountering each other we realized our difference in age (I'm old-they young) and our differences in gear and hiking styles (I am a heavy-weight, they were lightly geared), and group size (solo vs group), was nothing compared to our mutual enjoyment of the experiences we shared on the trail and in the terrain. Nature is everyone's common denominator. Meadow on West Side of Kennedy Lake. 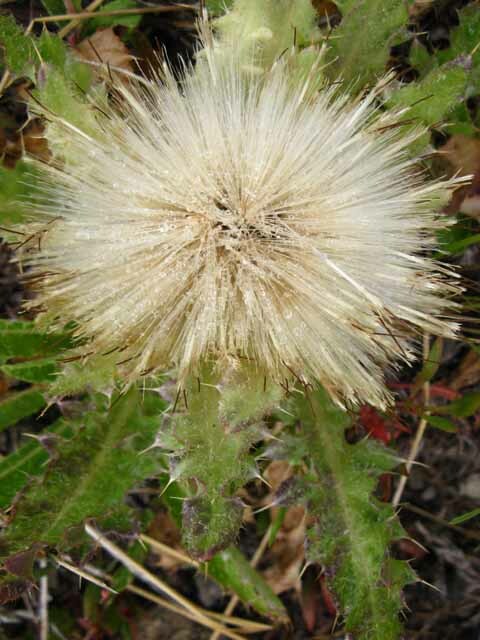 White Thistle in meadow below Kennedy Lake. It looks like the Joads went broke and took to foot. A fine campsite sits on the Northernmost corner of Kennedy Lake in a stand of fine Junipers. A great canyon opens up to the Northwest of Big Sam's crest, Southeast of the upper part of the valley above Kennedy Lake. A great granite basin surrounded by massive mountains of volcanic debris. This canyon is essentially a channel of granite spilling down into this volcanic valley above Kennedy Lake. 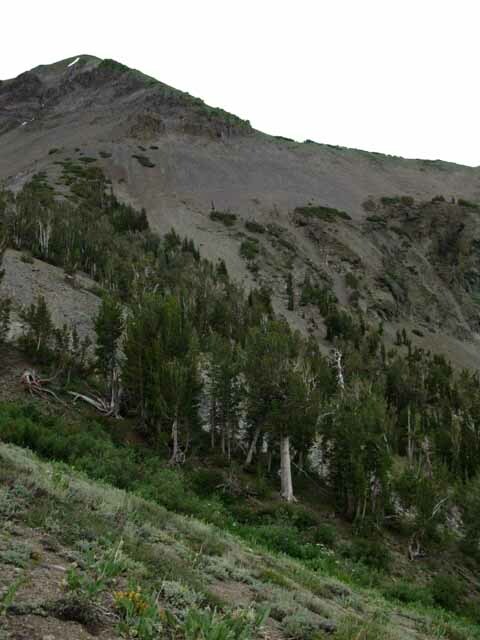 This canyon leads over to the High Emigrant Basin on the other side, via Lost Lake. 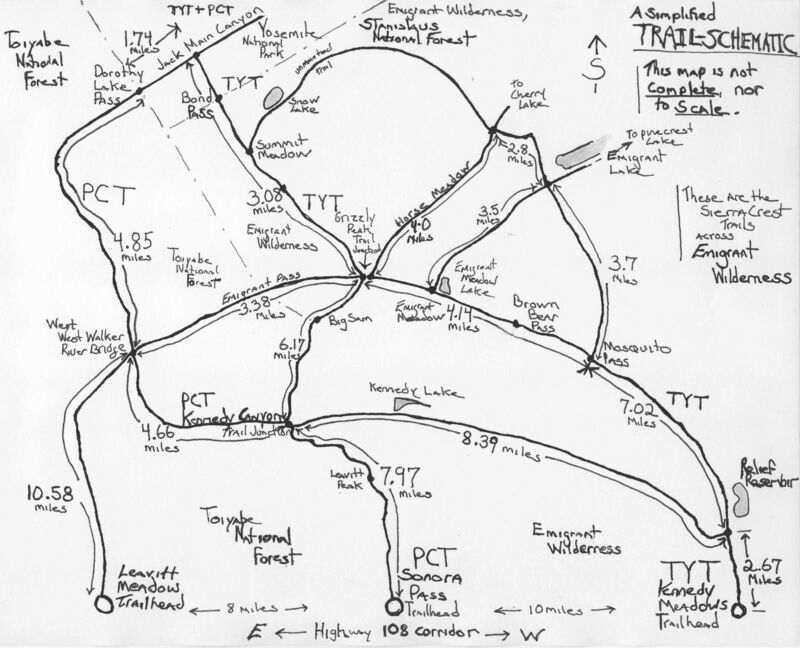 This looks like an exceptional scrambler's route, though I have not explored it. Check out this Emigrant Wilderness topo hiking map showing this potential route up through Kennedy Creek and over Big Sam to Emigrant Meadow. We enter Emigrant Meadow from the North, just a way Northeast of Brown Bear Pass. We see Molo Mountain peeking over from its position towering over Emigrant Meadow to our South, over our Right Shoulder. 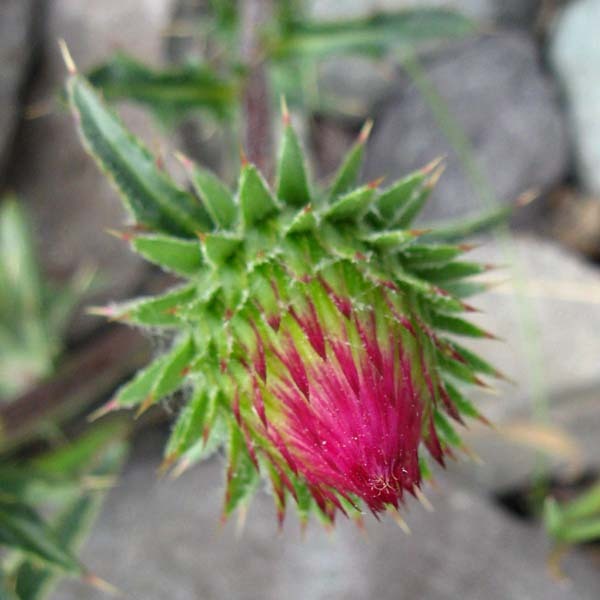 I believe this is an invasive plant. 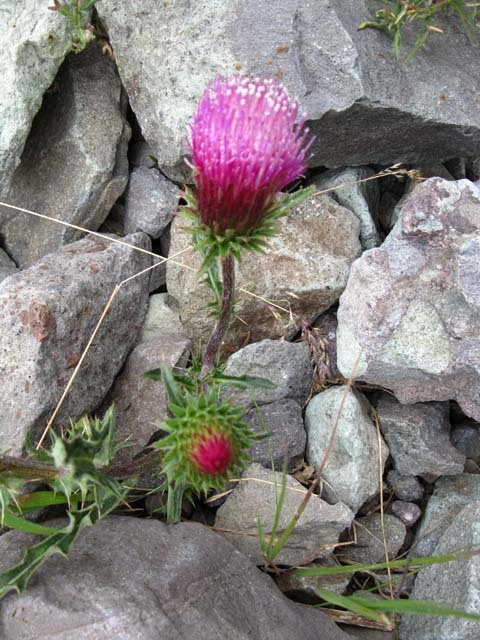 Carduus pycnocephalus L., Italian Thistle? 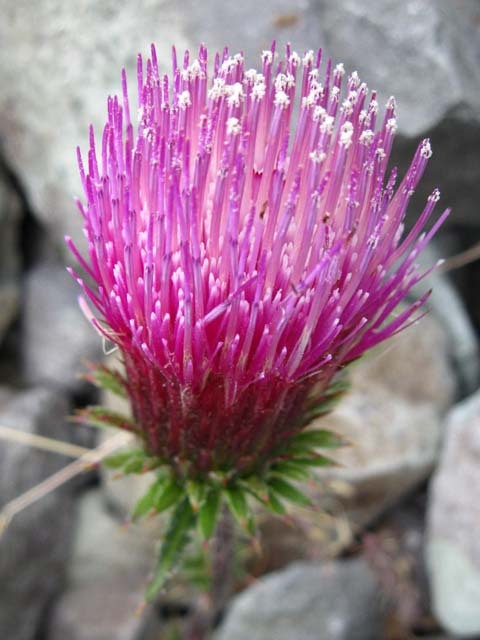 High Sierra Plants, Thistle, red, flower, detail. The course of Kennedy Creek flowing West down to Summit Creek is visible in the shape of lower canyon below Kennedy Lake. We can see Kennedy Creek's route is a grand "S" turn down to Summit Creek. In the distance beyond we can see the massive hulk of the Dardanelles shaping the horizon. Lodgepole pines in flat space above Kennedy Lake. West view down canyon holding Kennedy Lake. Again note the Dardanelles in the far distance. As Kennedy Creek's canyon steepens on it 's climbs towards its headwaters, and the PCT, the trail moves higher up the North bank of Kennedy Creek to avoid the deepening canyon. Northwest flank of Big Sam. Kennedy Creek flows down through a channel cut in the slope behind the trees. Almost to the top. Northwest side of Big Sam towers over us from our position on the North side of Kennedy Creek just below the Headwaters of Kennedy Creek at the base of the North Flank of Big Sam. The far West end of Kennedy Creek's Canyon draining into Summit Creek at a position below Relief Reservoir and above Kennedy Meadows. Outline of the Dardanelles is clear in middle distance. The Dardanelles divides Spicer Meadow Reservoir, under its far Western Flank along the TYT route to Lake Alpine, from the drainage of the Clarks Fork of the Stanislaus River, under its Eastern Flank. Climbing South over Big Sam into Emigrant Meadow brings expansive views of Kennedy Lake and its position nestled in under Leavitt Peak. Tail end of Kennedy Lake with terrain beyond revealing the shape of Kennedy Creek Canyon down to Summit Creek's canyon, where the East-West trail from Kennedy Lake intersects with the North-South route of the Tahoe to Yosemite Trail. The unique shape of the Dardanelles are visible beyond Summit Creek's canyon. Tail-like West end of Kennedy Lake visible at bottom of image. Kennedy Creek where the shortcut crosses South, Right, to Big Sam. Hikers East and West between Kennedy Lake and Kennedy Canyon do not hike down to Kennedy Creek. Where Westbound hikers heading to Kennedy Lake can see Kennedy Creek and the shortcut South up to Big Sam on the South side of Kennedy Creek is where the route down to Kennedy Lake stays high up on the North bank of Kennedy Creek. Don't go down to cross the creek unless you are hiking South over Big Sam into the High Emigrant Basin. Or you are thirsty and need water. The hiker coming up from Kennedy Lake to the PCT begins to turn Northeast (veering to our Left from the perspective of the image above) towards the PCT at the Kennedy Canyon trail junction as we approach the headwaters of Kennedy Creek sitting between Leavitt Peak to the North and Big Sam to the South. The Kennedy Canyon trail junction we are hiking towards sits in the low-flat gap on the Sierra Crestline between Kennedy Lake on the Western Flank of the Sierra Nevada and the Southbound PCT route heading down Kennedy Canyon on the Eastern flank of the Sierra. Note our position off of and above the North bank of Kennedy Creek running West down to Kennedy Lake. Hikers hiking East and West along Kennedy Creek must remain above the North side of the ravine holding Kennedy Creek. The remnants of trail linking the Kennedy Canyon trail junction West down to Kennedy Lake are located to the North of the creek out of its ravine. Eastbound hikers coming up from Kennedy Lake will be bending to their Left, to the North, to join with the Pacific Crest Trail passing through the Kennedy Canyon trail junction. 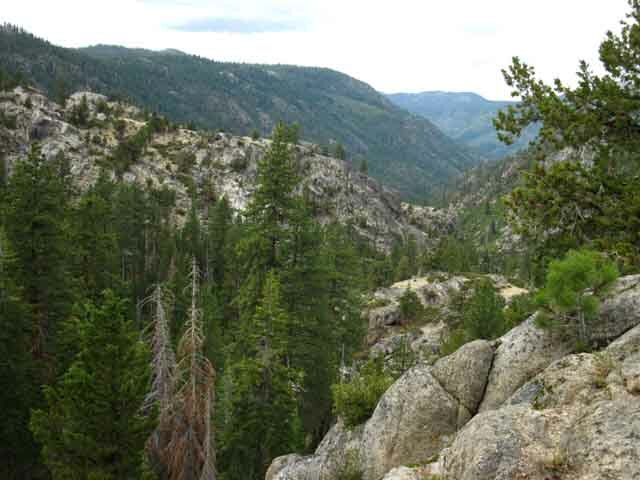 The Kennedy Canyon trail junction is located on the low flat between these two back to back valleys down the Eastern and Western flanks of the Sierra Nevada. Southbound hikers on the way to Emigrant and Grizzly Meadows will cross Kennedy Creek to catch the shortcut trail in the picture above, South up to the Tungsten Road over Big Sam. Northbound hikers will turn North on the Pacific Crest Trail at the upcoming Kennedy Canyon trail junction towards Sonora Pass. Southbound hikers along the PCT route will head East down Kennedy Canyon. Looking Southwest at the terrain sloping off down into Kennedy Creek in its deepening canyon and the Kennedy Canyon trail junction. In the background is the shortcut trail up the massive rising North flank of the Big Sam Massif. On the other side of the ravine holding Kennedy Creek we can see the shortcut trail heading up to the Tungsten Road, which is holding the line of snow on its roadbed across the top Right of the image. Following the Tungsten Road route South over Big Sam brings us to the Emigrant and Grizzly Meadows on the South Side of Big Sam in the High Emigrant Basin. There we find the Tahoe to Yosemite Trail crossing these meadows on its route across Emigrant Wilderness from Kennedy Meadows Pack Station to Bond Pass. From Grizzly Meadow we can cross Emigrant Pass to hike Northeast down to the base of Kennedy Canyon, below us to the East from our current position near the Kennedy Canyon trail junction. If we continue South through Grizzly peak to Bond Pass we can turn our hike North on the Pacific Crest Trail route back to our current position near the Kennedy Canyon trail junction. The Emigrant Wilderness has a huge amount of beautiful terrain to explore. 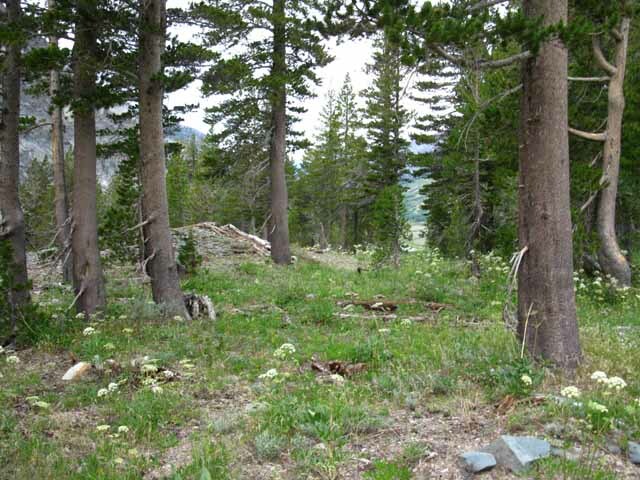 Check out the Topo Hiking Map of the trail between the Kennedy Canyon trail junction at the top of Kennedy Canyon over Big Sam to the TYT trail junction in Grizzly Meadow and South to Bond Pass and the Pacific Crest Trail. Big Sam in background. Trail to Big Sam crosses creek to hike shortcut trail. Our route to Kennedy Lake bends right as we hike down to the top of the steep bank along North side of Kennedy Creek while hunting for bits of the faint trail to our Right heading down to Kennedy Lake. The Tungsten Road just South of the Kennedy Canyon Trail Junction. 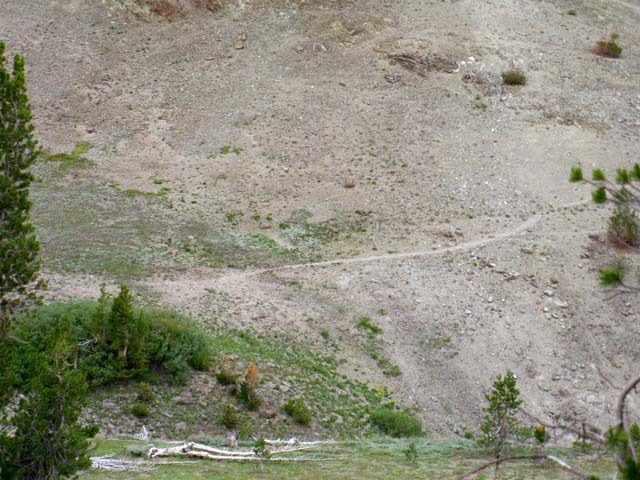 Very faint trail to the Right towards both the shortcut up Big Sam and the route West down to Kennedy Lake. The Tungsten Road bending off to the Left has narrowed to trail width here while a faint crease in the terrain heads Right towards Kennedy Creek. As of July 2012 the Kennedy Canyon trail junction marker was down. This old trail post has been knocked down and reset for decades. Actually this is the second trail post I've seen here over the years. 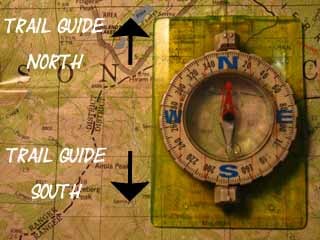 1> North on the PCT. 2>South on the PCT. 3> South to the TYT. 4> West to the TYT. over Leavitt Peak on the PCT to Sonora Pass. over Big Sam to the TYT trail junction at Grizzly Peak. down Kennedy Canyon following the Southbound PCT to Dorothy Lake Pass. down Kennedy Creek to TYT to Kennedy Meadows Pack Station Gate. In the video below we'll take a bird's eye view looking down at the little flat area along the Sierra Crestline that separates the two canyons descending down both East and Western flanks of the Sierra, and the two mountains that bracket this tiny flat to its North and South. Those are the four possible directions of travel and the features of each from the Kennedy Canyon trail junction down there on that flat. Mountains North and South with valleys East and West. To the West Kennedy Creek runs down to Kennedy Lake and beyond that down to the TYT above Kennedy Meadows Pack Station. To our East Kennedy Canyon brings the Southbound PCT hiker down the East flank of the Sierra to a web of trails emanating from Leavitt Pack Station on the Eastern Sierra. Big Sam rises on the South side of this little flat. The viewpoint of the video below is from our perch on the Southeast flank of the Leavitt Peak massif rising to the North of the Kennedy Canyon trail junction flat below. This film was shot from the vantage point on the Southeastern-most end of the PCT on the Leavitt Massif, to the North of the Kennedy Canyon junction below. The four-way trail junction situated on the North side of this small flat has trails radiating out to all four cardinal compass points. As this junction sits at the top of Kennedy Canyon, I call it the Kennedy Canyon trail junction. From this trail junction at the top of Kennedy Canyon Sonora Pass is 7.97 miles to our back North along the PCT, while the Tungsten Road tracks 6.17 miles South by the compass snaking its way up and over Big Sam to intersect with the Tahoe to Yosemite Trail at Grizzly Peak. The Southbound PCT route tracks East by the Compass down Kennedy Canyon to the West West Walker River. Here the PCT turns South to finish the 9.51 miles of total distance from the Kennedy Canyon trail junction up to our Dorothy Lake Pass entry into the Yosemite National Park's beautiful Northern backcountry. After hiking over Big Sam the Southbound hiker intercepts the Tahoe to Yosemite Trail coming up from Kennedy Meadows Pack Station at the trail junction in the shadow of Grizzly Peak in Grizzly Meadow. From Grizzly Peak the TYT tracks almost directly South to enter Yosemite and rejoin the PCT on the South side of Bond Pass. At the base of Bond Pass the TYT and PCT's divergent routes across the Emigrant Wilderness and Toiyabe National Forest come together for most of the remaining 55 miles between us and our next resupply spot to our South at Tuolumne Meadows. 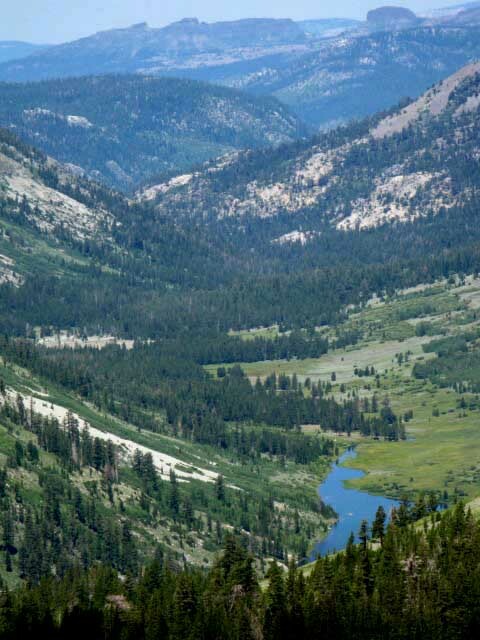 We also have options other than the various ways we can cross Emigrant Wilderness on our way South down the long trails to Tuolumne Meadows and points further South. 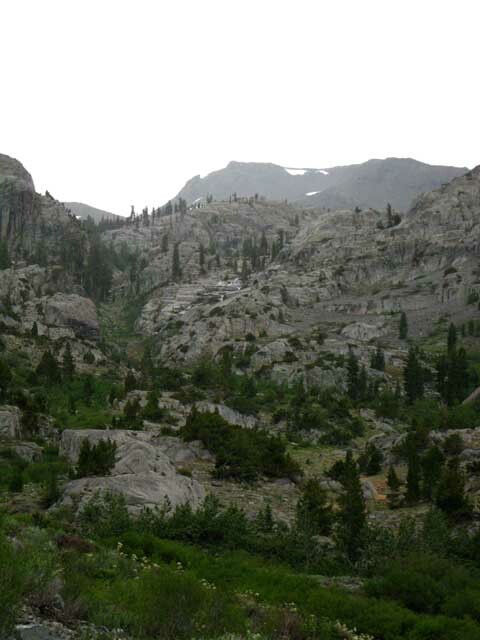 This Kennedy Canyon trail junction and the next trail junctions to the South at Grizzly Peak and the Bond-Dorothy Lake Passes provide many options for crafting local hiking loops remaining mostly within Emigrant Wilderness out of the Kennedy Meadows, Sonora Pass, Leavitt Lake or the Leavitt Meadow trailheads. Hiking South to the Kennedy Canyon trail junction with the PCT from any of these Highway 108 trailheads mentioned above gives us with a huge selection of short and medium distance backpacking arcs hiking across Emigrant Wilderness to and from any of the above trailheads. But we can stretch these trip out considerably, into long local trips. Hiking further South down to the Tahoe to Yosemite Trail junction at Grizzly Peak from any of our Highway 108 trailheads gives us a much wider selection of possible loops and trailhead to trailhead backpacking arcs in the Emigrant Wilderness. Hiking down to Grizzly Peak and the TYT from any of the trailheads along Highway 108 allows us to either craft long hiking loops back to our original trailhead that take in sizable chunks of the Emigrant Wilderness (30 to 50 miles), or we can bend our route to hike long trailhead to trailhead backpacking arcs across the many faceted beauties of Emigrant Wilderness (20 to 40 miles). If you push your turnaround point even further South to thread your route through Bond and Dorothy Lake Passes your grand circle hikes around Emigrant Wilderness can range from 30 to 90 miles in length hiking out of any of our Highway 108 trailheads. After we finish exploring the Crestline Trails we will begin planning on trips all the way down the West Flank to Pincrest Lake, maybe even Cherry and even Eleanor Lakes. Kennedy Canyon trail junction and major trails with their associated features reaching out North, South, East, and West. Now that we've gotten here, to the Kennedy Canyon Trail junction, we have some decisions to make, or we are executing plans already laid out and packed for. Do we head South on the PCT or South over Big Sam to the TYT? Either one of these two options require we eventually turn back towards our original trailhead from Grizzly Peak or Bond Pass, considerably lengthening our trip. Or we can hike the PCT North to Sonora Pass, and end our trip there. My suggestion is that you start with shorter trips, then build the length and duration of your trips as you become more comfortable with the altitude, the rigors of hiking long distances with a pack, and adept at using your gear to fend off rain, cold, mosquitoes, hunger, and fatigue. For many years I had looked down at Kennedy Lake hiking up Big Sam on my way South to Yosemite. Likewise I had looked up at the trail to climbing to Kennedy Lake while I was climbing the Tahoe to Yosemite Trail out of Kennedy Meadows Pack Station. Yet I had never hiked the trail linking the TYT on the West end of the Kennedy Lake Trail to the PCT on its Eastern end at the Kennedy Canyon trail junction. This changed after I hiked a big circle backpacking trip around the higher elevation sections of the Emigrant Wilderness mostly using the TYT and PCT routes. I figured I'd thow in as many of the trails I had hiked on less, or not at all. Some trips are to reinforce old knowledge, others are to learn new things. My route followed the TYT South out of Kennedy Meadows Pack Station over Mosquito Pass to Maxwell Lake. From Maxwell Lake through Horse Meadow to rejoin the TYT at Summit Meadow. From Summit Meadow over Bond Pass. Here we turn North on the PCT route. From Bond Pass we hike North through Dorothy Lake Pass along the PCT route to the Kennedy Canyon trail junction. Kennedy Canyon trail junction West past Kennedy Lake to the junction with TYT 2.67 miles South of Kennedy Meadows Pack Station. North to Kennedy Meadows. This was a good trip. I recommend it highly. Have a great Sierra Nevada trip or story to relate? A fine piece of gear?